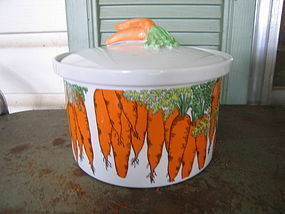 Vintage mixing bowl marked W. Germany 321-25. It holds 134 fluid ounces and is the largest of a nesting set. There are a few manufacturing flaws and two tiny fired in dark dots. The 96 ounces bowl is available for purchase. 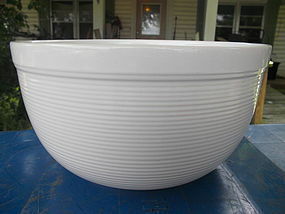 Vintage white mixing bowl marked W. Germany 321-21. This is the mid size of a nesting mixing bowl set. It holds approximately 96 fluid ounces. The exterior has concentric rings. There are no chips, cracks or breaks. There are very few signs of use. 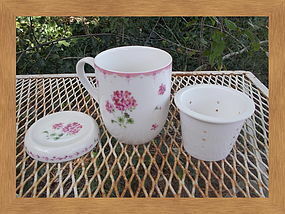 The largest size of the set is available for purchase. 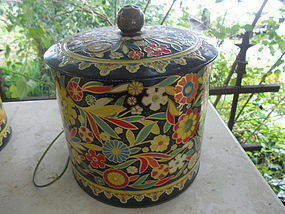 Vintage tin canister manufactured in England. it is part of a 4 piece set. 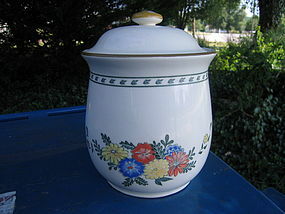 This is the second largest size and measures 5 3/8 inches in height, when measured WITHOUT the lid. There is no rust, but some loss to finish to the interior. 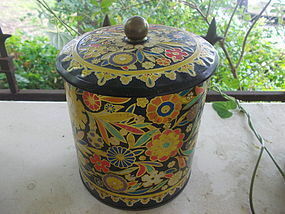 There is minor loss to the exterior enameling. The knob on the lid is a small dent to the lid as well as loss of finish. Additional photo of condition by email. 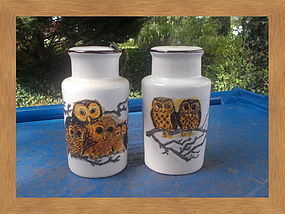 This is being sold as replacement, but all 4 sizes are available and priced individually. Replacement salt shaker. It is stamped as William Sonoma Made in Italy. The pepper has a small paint chip at the base, so am including it free. 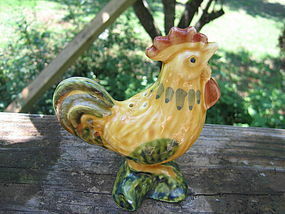 It is approximately 4 1/2 inches in height. The salt has no damage and has not been used. I need your zip code to calculate the postage. 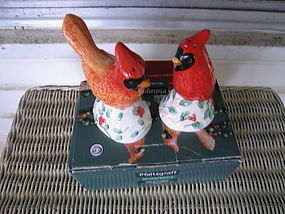 These are boxed unused salt and pepper shakers. The box does show considerable wear. They come with the enclosed use and care leaflet. I will be happy to sell as a replacement shaker for $12.00 for each. I need your zip code to calculate the postage. 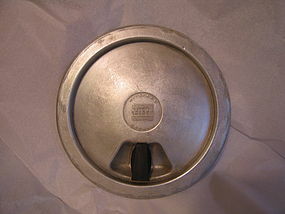 Replacement lid marked as 603-C 5. It measures 8 1/2 x 6 1/8 inches. It shows a few superficial usage marks. I need your zip code to calculate the postage. 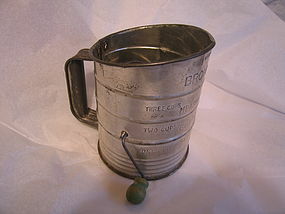 Vintage 3 cup tin sifter manufactured by Bromwell. There are some areas of age related darkening to the surface. The knob has not been "touched up" and shows loss to the finish. I need your zip code to calculate the postage. There are no model numbers on this lid for identification purposes. The width is 8 inches. There are usage marks and couple of tiny dings. The knob is secure with no chips or cracks, however, the material feels faintly rough, which may possibly be the aging process. It needs additional cleaning. I need your zip code to calculate the postage. 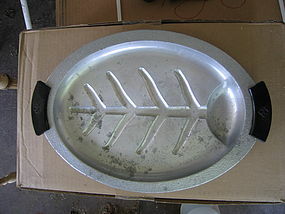 Vintage Club Hammercraft Meat Tree or Platter. The handles appear to be Bakelite. It measures 16 x 10 1/2 inches. It is supported by 4 feet. I photographed in natural light to show condition as accurately as possible. It needs cleaning - the tarnished areas are smooth. There are utensil marks to the surface and the rims of the handle have some minor roughness on the same place of both handles. I need your zip code to calculate the postage. 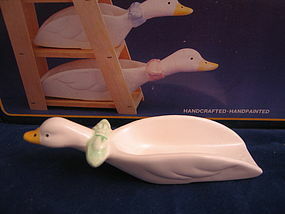 Four piece porcelain measuring spoon set from the "Blue Goose" craze of the nineties. There is no damage. 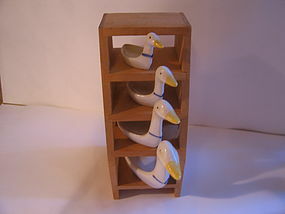 I have many "Blue Goose" items available. I need your zip code to calculate the postage. One of the smaller sizes which holds four knives in varying widths. It measures 8 x 6 x 4 inches. There is little if any sign of use. Additional photos are available by email. I need your zip code to calculate the postage. Replacement measuring scoop in 1/4 cup size. 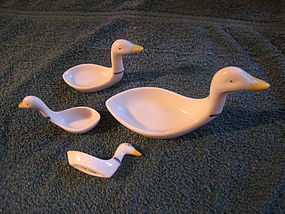 The original set was called Country Goose Measuring Scoops with Wooden Stand. 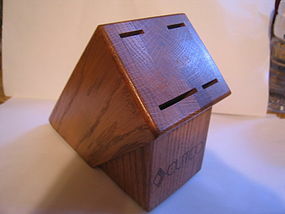 I can provide a photo of box for identification purposes. The set has never been used and the scoop has no damage. I need your zip code to calculate the postage.